The University’s Center for Human Rights and International Justice was established in 2005 to foster research, training, and work in international human rights. As part of the center’s efforts, David Hollenbach, SJ, director of the center, and Michael Delaney, humanitarian director of Oxfam America, are co-teaching a course titled “Human Rights, Humanitarian Crises, and Forced Migration: Ethical, Political, and Religious Responses.” The class will utilize texts such as the United Nations’ Universal Declaration of Human Rights, and guest lecturers including Elizabeth Ferris, co-director of the Brookings-Bern Project on Internal Displacement. 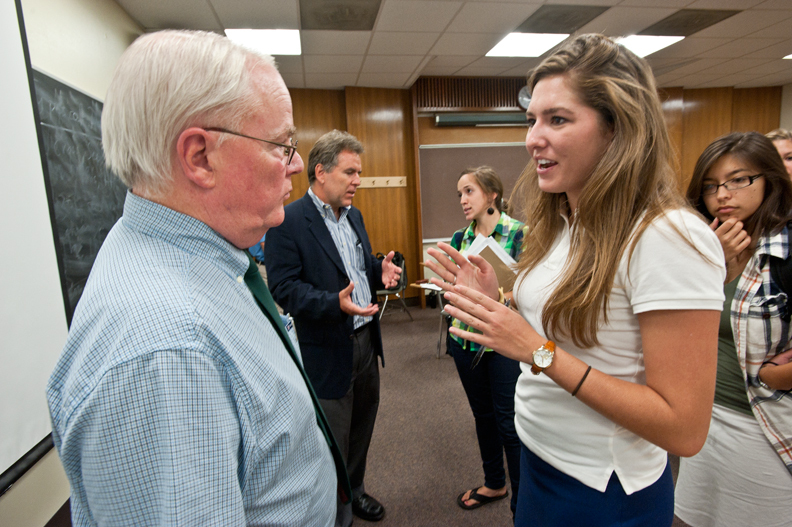 Following the first class on September 7 in McElroy 208, Hollenbach (left) and Delaney (rear), talk with class members Emily Gannam ‘11 and Avila Stahlman ’12. This feature was posted on Wednesday, September 15, 2010 and is filed under Featured Photo.